By the time crops show physical symptoms that they’ve been attacked by insects, plant pathogens or other stressors, it’s often too late. Researchers at NC State are making quick progress in developing affordable, reliable and small sensors that can detect and diagnose agricultural problems so fast that farmers have time to prevent crop loss. Working together, two Ph.D. students in engineering and a postdoctoral plant science researcher have created a tiny array of sensors coated with polymers that can detect the unique bouquet of volatile organic compounds, or VOCs, that plants emit in response to different stressors. VOCs activate the plant’s molecular defense systems, attract beneficial insects and warn surrounding plants of an impending attack. From left, Chunkyun Seok, Nasie Constantino and Marzana Mahmud were recognized recently by BASF Corp. for their work developing the sensor. The project won the 2018 BASF Science Competition, which recognizes young North American researchers making headway with problem-solving ideas. The winners are Nasie Constantino, postdoc in the Department of Entomology and Plant Pathology, and Marzana Mahmud and Chunkyun Seok, who are pursuing doctorates in the Department of Electrical and Computer Engineering. One of the PSI’s first events was a daylong mashup that brought together about 50 NC State plant scientists and engineers last year. It was then that plant pathologist Ralph Dean, food microbiologist Sophia Kathariou, chemical engineer Greg Parsons and electrical engineer Omer Oralkan realized that, together, they had the expertise needed to create novel sensors to detect and discriminate VOCs from stressed plants in real time. With a one-year grant from a North Carolina Agricultural and Life Sciences Research Foundation and funding from the researchers’ departments, they hired Constantino, who had completed her Ph.D. research at Texas A&M University on plant VOCs. She led the proof-of-concept research with Mahmud and Seok. The sensor can immediately detect the VOCs emitted by corn plants when wounded or attacked by an insect. The researchers are continuing to collaborate to further refine the sensor. 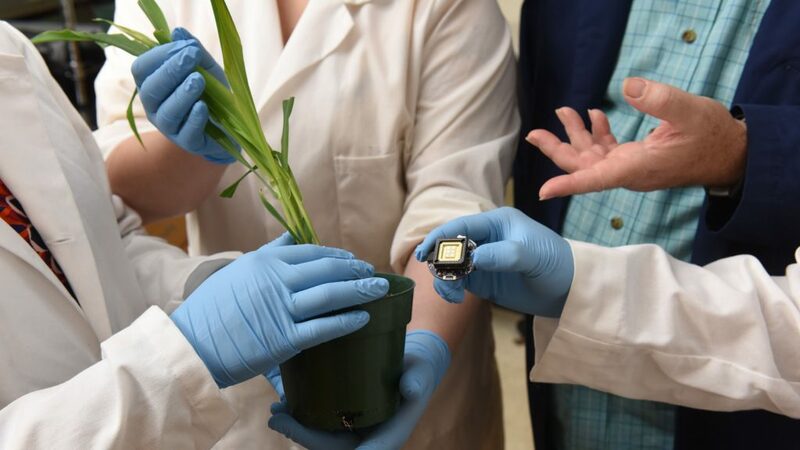 The team successfully created a quarter-sized sensor that could immediately detect the VOCs emitted by corn plants when wounded or attacked by an insect. To further their research and refine the sensor array, the team has received additional funding from BASF. 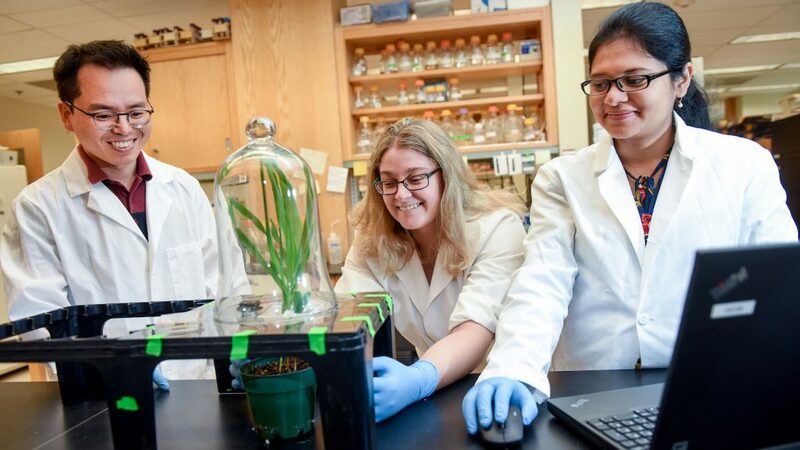 The research goal of this new project is to refine the technology to detect VOCs emitted by another important food crop in response to a destructive plant disease. In other work, the team is exploring the use of this technology to determine when pathogens, like Escherichia coli, that cause foodborne diseases in humans are present in fresh vegetables before they are consumed by the public. The sensors can communicate wirelessly, and they have a very small battery, so they can last for many months. One of those dividends is an upcoming international workshop to be held under the banner of the College of Agriculture and Life Sciences’ Stewards of the Future series. Called “Communicating with Plants: Deciphering and Manipulating Chemical Signals Through Electronics,” the event takes place Dec. 2-3 at NC State. During stress, such as pathogen infection and insect herbivory, plants produce a unique bouquet of volatile organic compounds (VOCs) that can activate their defense pathways, attract beneficial insects, and warn surrounding plants of an impending attack. Since each type of plant stress can produce a distinctive composition of VOCs, it stands to reason that this phenomenon can be exploited for the use of monitoring plants in field, greenhouse, and lab conditions. By creating a unique cross-disciplinary partnership between engineers and plant pathologists, a new generation of real-time sensor array technology can be developed and evaluated for the rapid detection and identification of plant-sourced VOCs. … In preliminary experiments, we have shown our sensors to be able to detect the systemic release of VOCS within moments after wounding in real time. We believe this technology has a wide array of uses for the early detection of plant stress and other applications.